Who is Charles David Head? I was born and raised in rural Marion County, in South Pittsburg, Tennessee, a town now famous for its National Cornbread Festival. Between my childhood and teenage years I was always collecting something - rocks, coins, stamps, and Indian relics, just to name a few of my early hobbies. 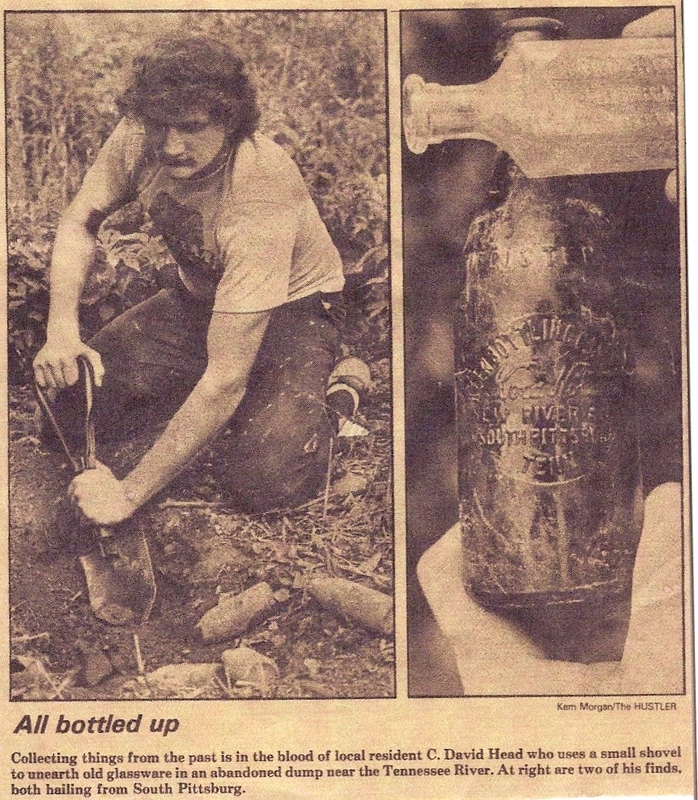 In the summer of 1975, at age 15, I was "hooked" by the antique bottle collecting hobby when I was walking across a pasture and found a cork-stoppered iodine bottle. The bottle wasn't old, but it fascinated me, so I started to hunt for more of them. Back then, as now, when my interests changed I would always delve into the "historical" side of that particular hobby by reading books on the subject and seeking insight from others in the community who collected or dealt in antiques and artifacts. I have always had a very keen interest in history. My first course of action back then was to purchase a copy of Cecil Munsey's The Illustrated Guide to COLLECTING BOTTLES. My interest in the historical aspects of antique bottle collecting was further kindled by two high school teachers who often allowed me to bring antique bottles and Indian relics to their classrooms for "show and tell" days. The tolerance and encouragement of Mrs. Frances Merriman, my biology teacher, and Mrs. Jan Henderson, my world history and world geography teacher, did wonders for my collecting interests and ego. I will never forget their kindness and hope I thanked both of them back then for allowing me to bring some "hands-on" history to the classroom to share with fellow classmates. From my high school years to my early thirties, three people in the community had a profound and positive influence on my interest in collecting and preserving the history of antique bottles and artifacts/antiques. All three have since passed on, but I'll always remember their kindness and useful advice. Mr. George Reynolds took me to hundreds of old home sites to search for antique bottles and walked with me thru many a plowed field looking for Indian relics in the New Hope, Tennessee, and Long Island, Alabama communities. George showed me where to look for treasures from yesteryear and what signs to watch for that would most likely lead to the discovery of antique bottles, Indian relics, and Civil War artifacts. Ms. Faye Ridley employed me on a part-time basis at her antiques store in South Pittsburg for nearly 15 years. An honest and forthright lady, Ms. Ridley was the first person people in the community called upon when they had antiques to sell. She taught me that to succeed in business one had to be honest and trustworthy, your word was your bond, and you never, ever broke a promise. Under her apprenticeship I learned about every antique imaginable, from weaving looms to Roseville pottery, and bottles to Barbie dolls. Ms. Ridley was happy to share her knowledge of the antiques trade with me yet she was also quick to set me right when she heard I'd strayed from the straight and narrow path of life. Needless to say, I often received a good chewing out when it was needed and in my youth that was a regular occurrence! For many years, Mr. Marion Loyd of Bridgeport, Alabama, owned and operated a hardware store that had been in his family since the Civil War era. As a sideline he amassed a huge collection of antiques and memorabilia from Bridgeport, and often he would buy items from me. Mr. Loyd and I shared a keen interest in antique bottles, so we spent many hours discussing their use and places in the community where he thought I might locate bottles and other artifacts. Mr. Loyd instilled in me the importance and necessity of collecting and preserving historical artifacts, documents, relics, antiques, and old bottles so that the next generation can learn from them and enjoy them as they study and celebrate their heritage. He was a wise man and I am a better man today because I heeded his advice. This web site and my upcoming book(s) are a direct result of Mr. Loyd's legacy of preserving the past for future generations to enjoy. The majority of items now on permanent display at the Bridgeport, Alabama Railroad Depot Museum were donated by Mr. Loyd; his efforts to preserve the town's history paid off handsomely. In 1982 relatives of mine discovered an old dump site near the Tennessee River in South Pittsburg while digging worms for a fishing trip. Knowing I collected antique bottles, they told me about the dump and the bottles. I dug in the dump for two weeks and found hundreds of bottles, the majority of them being sodas. Back then I rarely picked up crown top sodas as they weren't deemed old enough to be very valuable or worthy of being added to a collection. Nonetheless I took 17 crown top sodas home with me. The best of the lot was an amber Koca Nola bottle I kept because it has two towns embossed on it: New River and South Pittsburg, Tenn. That the bottle had two embossed town names piqued my interest, particularly because South Pittsburg was my home town! The following newspaper clipping is from the South Pittsburg (Tenn.) Hustler, June 3, 1982. Note the amber crown top embossed REGISTERED / KEEN BOTTLING COMPANY / Koca Nola / NEW RIVER AND / SOUTH PITTSBURG / TENN. In 1999 my good friend Tom Lines of Birmingham, Alabama sold me an elusive FLORIDA / KOCA NOLA / BOTTLING CO., my first Koca Nola Hutchinson bottle. I soon reacquainted myself with my Keen Bottling Company Koca Nola from New River and South Pittsburg, and since then have been digging into the Koca Nola Company's history and collecting Koca Nola soda bottles and go-with items. Although I collect other bottles besides Koca Nolas, they are my top priority. My sincere thanks to Tom for fueling my interest in Koca Nolas! During the summer of 2000, Robert Hookey, an antique bottle collecting friend from South Pittsburg, took me to my first antique bottle show in Knoxville, Tennessee. I was in awe of all the bottles there! Seeing all of those bottles helped me realize I needed to downsize my collection even further, so I began to sell off most of my Tennessee and Alabama Hutchinson sodas and concentrate on Koca Nolas and all types of bottles from my area (Marion County, Tennessee, and Jackson County, Alabama). I scanned eBay almost daily for new Koca Nolas and was surprised at the number of bottles that often came up for sale. The prices were so reasonable that I won most everything I bid on. Noting there were a wide variety of embossed Koca Nolas from many states started me thinking the soda wasn't just the regional, Southern soda I once believed it to be. Initial research into Koca Nola Company history yielded little information as there were very few listings in available books on antique bottle collecting. Since 2000, however, several fellow collectors have aided my research and while the information has generally surfaced only in bits and pieces, I have made tremendous progress. In the fall of 2004, Harry Evans, a good friend from Jasper, Tennessee, suggested I write a book on Koca Nola and even came up with a title: A Heads-Up On Koca Nola. When I received some very positive feedback from Mr. Bill Baab concerning a Koca Nola article I'd written for Antique Bottle & Glass Collector magazine, I again considered Harry's suggestion about a Koca Nola book. When Bill Baab offered his assistance, that was that; I figured that if one of the hobby's pioneers had enough confidence in me that he'd offer to assist with the project, I'd do the book! During the past nine years, Bill and I have more than tripled the number of confirmed Koca Nola franchises and brought to light many newly re-discovered soda bottles and go-withs. Bill's vast experience and recognition inspired others to also contribute to the project, most notably Ron Fowler of Littlerock, Washington in 2006, Dennis Smith of Buffalo, New York in 2008, and Jerrell Melear of Fairburn, Georgia in 2010. Ron created (and maintains) www.KocaNola.com in 2009, the first and only web site devoted to Koca Nola. Dennis Smith has rediscovered around 23 previously unknown Koca Nola franchises on his own. Jerrell Melear has spent countless hours conducting valuable research into the last eight years of the Koca Nola Company (1911-1918). In all likelihood, there would be no Koca Nola book but for Harry, Bill, Ron, Dennis, and Jerrell, and the many other contributors. As others view this web site, it is my hope they will understand the importance of the Koca Nola Company, its contributions to the soda bottling industry, and the need to preserve its history, soda bottles, and go-withs for future generations. March-April 2007: The T. C. I. & B. Co.
January 2009: Recent Koca Nola Finds! June 2010: Ms. Lizzie Bonner Versus the Macon Coca-Cola Bottling Co.
Was built in this hollow in the year nineteen o' four. All the windows are broken, the steps appear wilted. The families have moved on, this old house now forgotten. I can almost feel the warmth of a fire, as scent of wood smoke there seems still a trace. The bedrooms look so huge now that they are bare. The crops done good this year, no sorrows came that they had to face. Ma, tell us one more ghost story before bedtime and let's hope ole "bloody bones" don't come a-thumping! Where the legs of that cast-iron cook stove left dents in the rug, being as heavy as it was stout. On that old Jacobs range were cooked once upon a time. Are traces of copper wire where they ran the electricity in fifty-four. Is where the privy once stood now only a hole in the ground and some tin perhaps. The water from the spring has long since dried up, the barn has fallen down. Where once stood the smokehouse is now a patch of barren ground. Moms and Dads, boys and girls, grandpas and grandmas, neighbors galore. This old house may now be empty, but the memories will linger on for evermore!